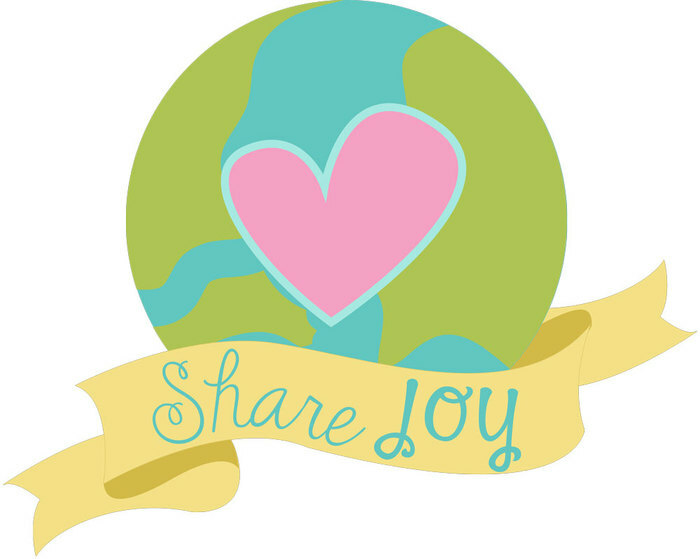 I am so excited to be participating in this blog hop today! I was a member of the TE team for quite a while, so it's crazy to think this all started 10 years ago!!! 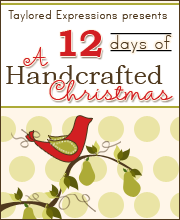 There are over 40 designers participating in this hop today!! How exciting is that!!?? You can find the whole list on Taylor's Blog! Last night, new products were released and you can find those products HERE. I have used an older set to create my card in celebration of TE's Birthday!! My card uses the Tropical Trio Stamp & Die Combo! I've also used some fun papers from TE including the Hello Sunshine Paper Pack and Blue Raspberry and Pineapple cardstocks!! 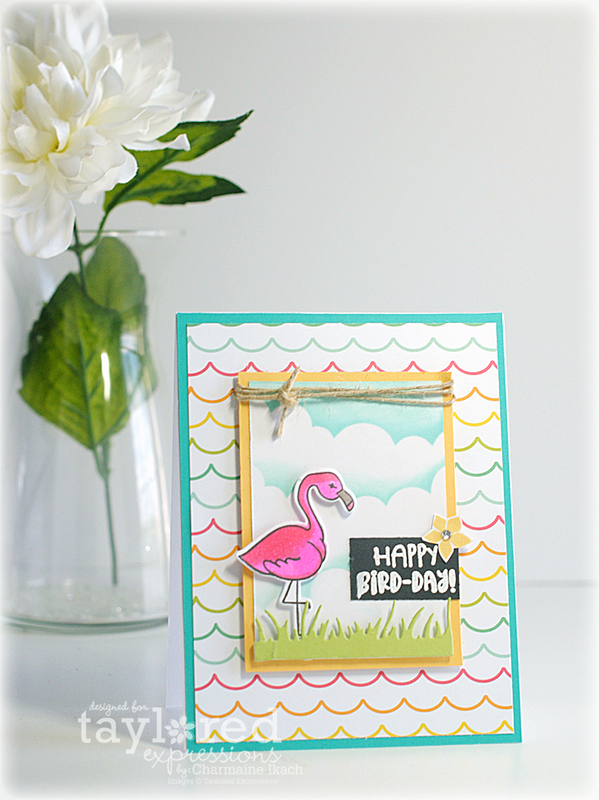 The clouds in the background were created using some Confetti Cake ink and the Set the Scene Clouds Stencil Strips. I hope you'll consider joining the campaign and sharing some joy!! Thanks for stopping by and celebrating these wonderful 10 years with us!! Welcome back to Day 4 of Verve's April Release Spotlight Hops! This month we're combining our release hop with our monthly Diva Inspirations Hop & Challenge. We're stamping with a yellow color scheme this month and would love to see what you create. 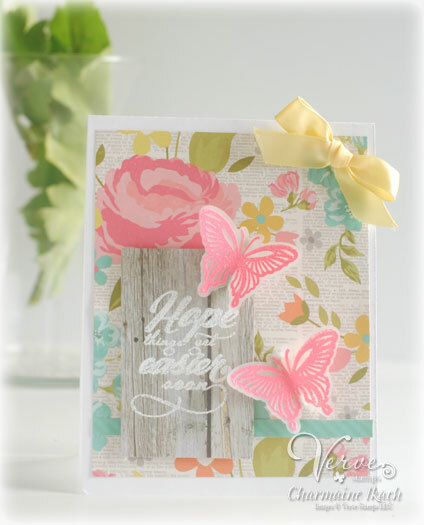 Hop along to see our takes on the challenge, then get inky and show us your take! And since this is our April release hop, there's new Verve in the store this morning with a fabulous prize along our hop! Three beautiful new sets and coordinating die sets just released and the entire April collection is up for grabs to one lucky commenter on our hop today! Today's featured focus is designer's choice combined with our April inspiration, so you might just sneak a peek at a whole bunch of must-haves! Check out all the challenge details on the Verve blog today. If you came from visiting Betty, you're in the right place!! 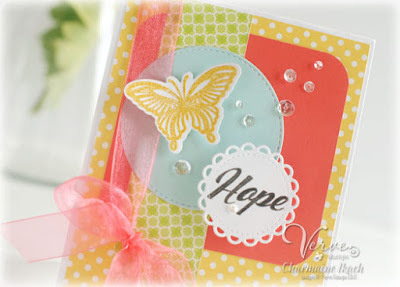 Today I used the Hope Lifts stamp set and coordinating Lifted Hope Die Set for my card with some yellow for the inspiration challenge! I also used this month's Viva la Verve Sketch Challenge!! Be sure to visit Laurie next to see what beautiful creation she has waiting for you! Thanks for stopping by! Welcome back to Day 3 of Verve's April Release Spotlight Hops! The Verve Divas and special guest are back for another day of spotlighting our new release! Everything previewed this week will be available to order in the Verve online shop on Tuesday, April 10. Today we're sharing our first projects featuring the Sentimental Wishes stamp set. 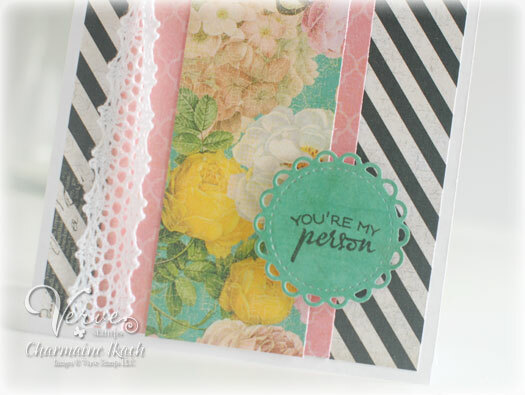 This set pairs beautifully with the new Lacey Frames and Lacey Trim Duo die sets. If you've come from visiting Betty, you're in the right place! For today's card I used some fantastic papers from my stash from Heidi Swapp. I loved the bold stripes with the feminine flowers. The sentiment is just perfect for my bff! :) The dies that Verve is releasing this month are wonderful! I LOVE these little lacey frames and trim! Next on today's hop is Laurie!! Thanks for stopping by today! Welcome back to Day 2 of Verve's April Release Spotlight Hops! The Verve Divas and special guest are back for another day of spotlighting our new release! Everything previewed this week will be available to order in the Verve online shop on Tuesday, April 10. Today we're sharing our first projects featuring the Hope Lifts stamp set and coordinating Lifted Hope Die Set. If you've arrived from visiting Betty, you're in the right place!! Today's card I used some pretty, happy colors with flowers to really bring out the butterflies in this set. 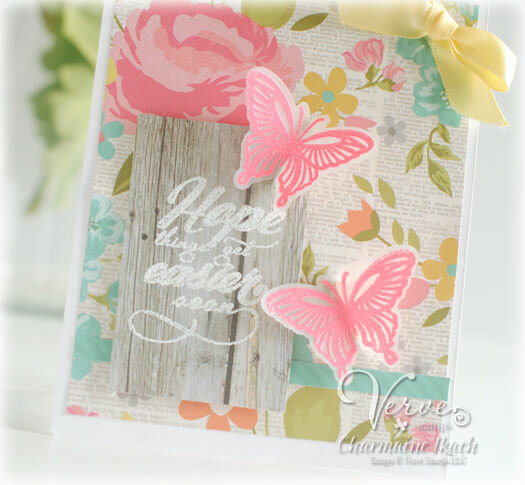 Beautiful sentiments in a beautiful font make Hope Lifts a must have for your stamp collection! Next on today's hop is Laurie! Thanks for stopping by! Welcome to Verve's April Release Spotlight Hops! A new release is just around the corner and for the next few days we'll be shining our creative spotlights on the new Verve sets and dies releasing Tuesday, April 10. 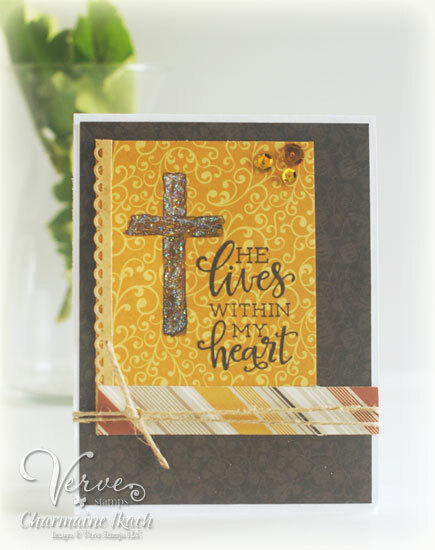 Today the Divas and special guests are sharing inspiration featuring the new Risen Savior stamp set. 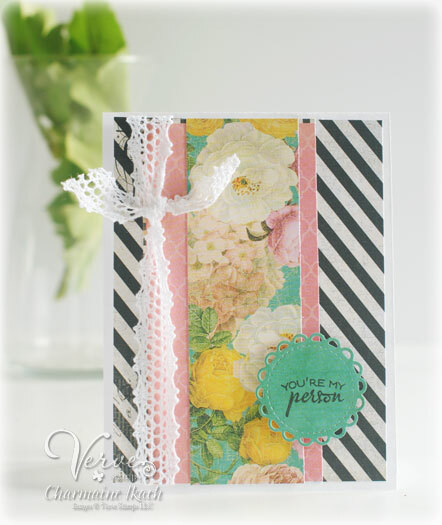 Check out the Verve Blog post today for the full hop list, prize details, reveals and a little more on this fun new set. If you've come from visting Betty, you're in the right place!! Today we're featuring Risen Savior, which a beautiful set!! It has beautiful sentiments set in a beautiful font! Next on today's hop is Marisa!! Verve October Mini Release Spotlight Hop!! Welcome to Verve's October Mini Release Spotlight Hop! 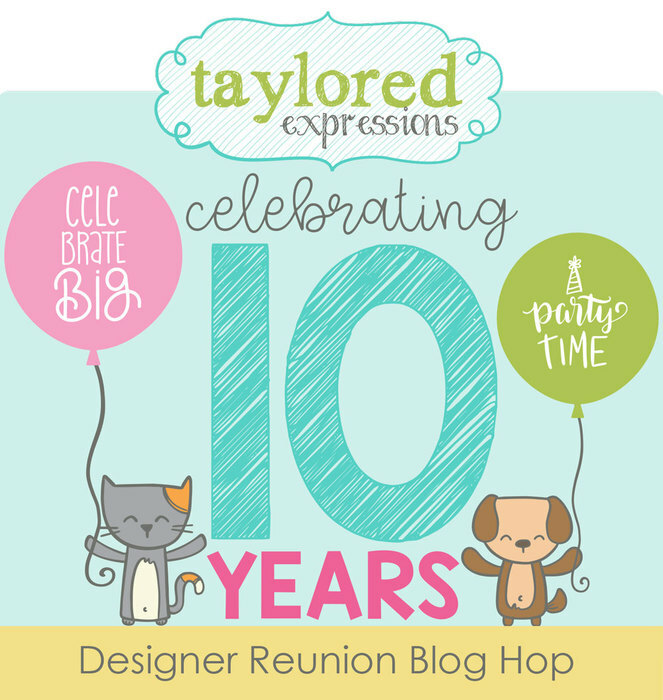 There's something new in the Verve shop today, and we're celebrating with a blog hop. Along the hop you'll see the Divas' first looks at the new Autumn Leaves stamp set and Falling Leaves die set. We're also hosting a little giveaway,so why not join in the fun and hop along with us? Just leave a little shout out in the comments at each stop and you'll be in the prize drawing for the new products. Check out the Verve Blog today for a little more about the new goodies and all the prize info and deadlines. If you've come from visiting Julee, you're in the right place!! 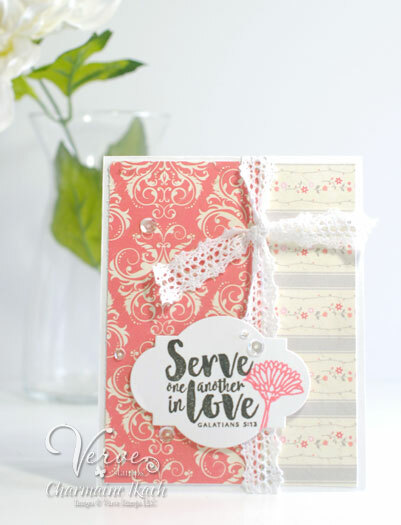 I just LOVE this new set and die set from Verve!! I LOVE the images, the sentiments and the coordinating dies make it a definite must have!! 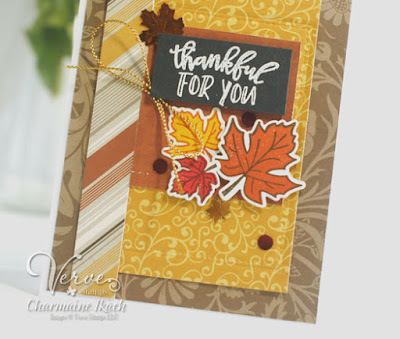 I used some Fall papers from my stash to create this card, as well as the latest VLV Sketch! 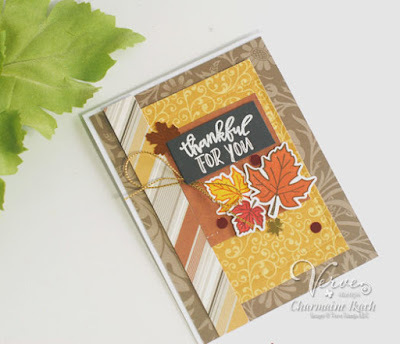 I stamped the leaf outlines first, then used the "filler" stamp second for perfect alignment. I love the two-step stamping capabilities of this set!! 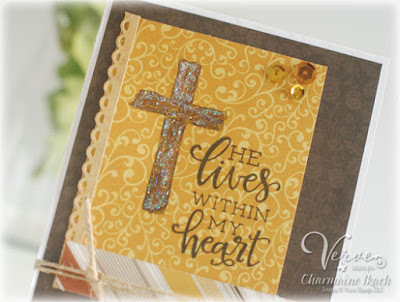 The sentiment was stamped and embossed in white on black cardstock. As a finishing touch, I added some gold cording. Next on today's hop is Maureen!! Thanks for stopping by!! If you've come from visiting Betty, you're in the right place!! 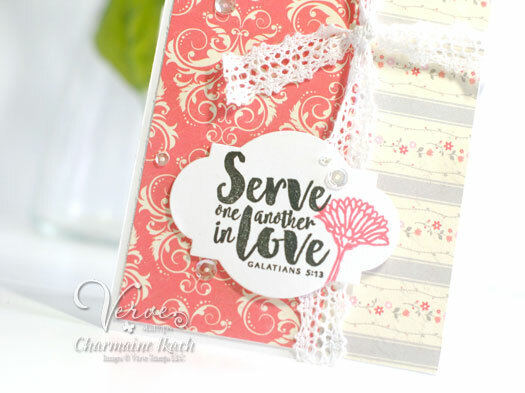 For today's card, I stuck with the Scripture Medley 5 stamp set. I just love the verses in this set. I die cut a piece of white cardstock using the Classy Label Die and stamped the sentiment in black ink. I found some pretty papers in my scrap bin that would create an elegant card and went with that. As a finishing touch, I added some trim and some sequins. Thanks for stopping by all week!! 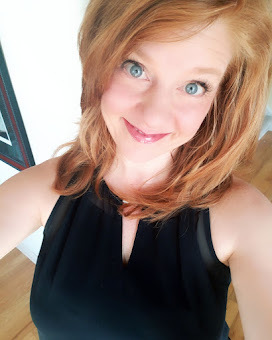 I hope you've been inspired! Next on today's hop is Marisa! !